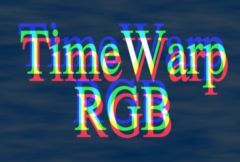 Shifts the red, green, and blue channels in time by different amounts, to give a temporal chroma distortion. Source: The input to process. In Batch, it is recommended that this input be a clip of frames rather than another node. Brings up the Preset Browser to browse all available presets for this effect. Brings up the Preset Save dialog to save a preset for this effect. Shift Frames Red: Integer, Default: 1, Range: any. The number of frames to shift the red channel. Shift Frames Green: Integer, Default: 0, Range: any. The number of frames to shift the green channel. Shift Frames Blue: Integer, Default: -1, Range: any. The number of frames to shift the blue channel. Clamp Chroma: Default: 1, Range: 0 to 1. If less than one, the chroma of the output is reduced to this value. This can help keep the output colors video safe. Mocha: Default: 0, Range: 0 or greater, Shared . Brings up the Mocha window for tracking footage and generating masks. Blur Mocha: Default: 0, Range: 0 or greater, Shared . Blurs the Mocha Mask by this amount before using. This can be used to soften the edges or quantization artifacts of the mask, and smooth out the time displacements. Mocha Opacity: Default: 1, Range: 0 to 1, Shared . Controls the strength of the Mocha mask. Lower values reduce the intensity of the effect. Invert Mocha: Check-box, Default: off, Shared . If enabled, the black and white of the Mocha Mask are inverted before applying the effect. Show Mocha Only: Check-box, Default: off, Shared . Bypass the effect and show the Mocha Mask itself. Bypass Mocha: Check-box, Default: off, Shared . Ignore the Mocha Mask and apply the effect to the entire source clip. See general info for: Res , Redraw , Undo , Load Defaults , Crop , Add Noise , and Use Gamma .